Definition at line 1897 of file DeclTemplate.h. Definition at line 2040 of file DeclTemplate.h. Definition at line 2042 of file DeclTemplate.h. Definition at line 852 of file DeclTemplate.cpp. Definition at line 875 of file DeclTemplate.cpp. This is not the same as the type-decl-type for this partial specialization, which is an InjectedClassNameType. Definition at line 2032 of file DeclTemplate.h. Referenced by clang::Sema::getMoreSpecializedPartialSpecialization(), clang::Sema::isMoreSpecializedThanPrimary(), and clang::ASTNodeImporter::VisitClassTemplateSpecializationDecl(). Retrieve the member class template partial specialization from which this particular class template partial specialization was instantiated. 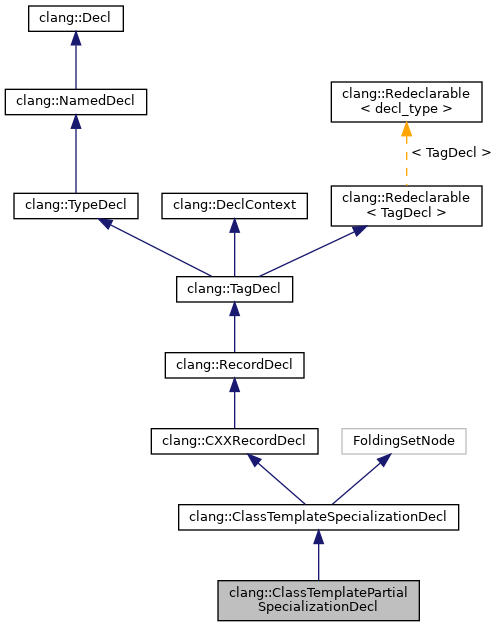 In this example, the instantiation of Outer<float>::Inner<int*> will end up instantiating the partial specialization Outer<float>::Inner<U*>, which itself was instantiated from the class template partial specialization Outer<T>::Inner<U*>. Given Outer<float>::Inner<U*>, this function would return Outer<T>::Inner<U*>. Definition at line 1983 of file DeclTemplate.h. Referenced by clang::ClassTemplateSpecializationDecl::getSourceRange(), isInstantiationOf(), and clang::ASTDeclWriter::VisitClassTemplatePartialSpecializationDecl(). Definition at line 1989 of file DeclTemplate.h. Definition at line 1947 of file DeclTemplate.h. Definition at line 1959 of file DeclTemplate.h. Referenced by clang::TemplateDeclInstantiator::InstantiateClassTemplatePartialSpecialization(), clang::ASTDeclWriter::VisitClassTemplatePartialSpecializationDecl(), and clang::ASTNodeImporter::VisitClassTemplateSpecializationDecl(). Definition at line 1954 of file DeclTemplate.h. Referenced by clang::Sema::DeduceTemplateArguments(), clang::comments::DeclInfo::fill(), clang::TemplateDeclInstantiator::InstantiateClassTemplatePartialSpecialization(), clang::ASTDeclWriter::VisitClassTemplatePartialSpecializationDecl(), clang::ASTNodeTraverser< Derived, NodeDelegateType >::VisitClassTemplatePartialSpecializationDecl(), and clang::ASTNodeImporter::VisitClassTemplateSpecializationDecl(). Determines whether this class template partial specialization template was a specialization of a member partial specialization. Definition at line 2015 of file DeclTemplate.h. Definition at line 1993 of file DeclTemplate.h. Definition at line 2022 of file DeclTemplate.h. Definition at line 1931 of file DeclTemplate.h. Definition at line 1932 of file DeclTemplate.h.